Donald David Dixon Ronald O’Connor (August 28, 1925 – September 27, 2003) was an American dancer, singer, and actor who came to fame in a series of movies in which he co-starred alternately with Gloria Jean, Peggy Ryan, and Francis the Talking Mule. He is best known today for his role as Gene Kelly's friend and colleague Cosmo Brown in Singin' in the Rain (1952). Though he considered Danville, Illinois to be his home town, O’Connor was born in St. Elizabeth Hospital in Chicago. His parents, Effie Irene (née Crane) and John Edward "Chuck" O'Connor, were vaudeville entertainers. His father's family was from County Cork, Ireland. When O'Connor was only a few years old, he and his sister Arlene were in a car crash outside a theater in Hartford, Connecticut; O'Connor survived, but his sister was killed. Several weeks later, his father died of a heart attack while dancing on stage in Brockton, Massachusetts. O'Connor at the time was being held in the arms of the theater manager, Mr. Morris Sims. O'Connor began performing in movies in 1937. He appeared opposite Bing Crosby in Sing You Sinners at age 12. Paramount Pictures used him in both A and B films, including Tom Sawyer, Detective and Beau Geste. In 1940, when he had outgrown child roles, he returned to vaudeville. In 1941, O’Connor signed with Universal Pictures, where he began by appearing in seven B-picture musicals in a row, starting with What's Cookin'? (1942) and ending with Mister Big (1943). Peggy Ryan and Gloria Jean were in four each. Before Mister Big (1943) was released, O’Connor’s popularity soared. Universal added $50,000 in musical numbers to Mister Big (1943) and promoted this B movie to an A. His subsequent films were all A’s. 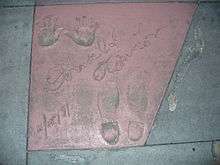 The handprints of Donald O'Connor in front of The Great Movie Ride at Walt Disney World's Disney's Hollywood Studios theme park. On his 18th birthday in August, 1943, during World War II O'Connor was drafted into the United States Army. Before he reported for induction on Feb. 6, 1944, Universal already had four O’Connor films completed. They rushed production to complete three more by that date. With a backlog of seven features, deferred openings kept O’Connor‘s screen presence uninterrupted during the two years he was overseas. Upon his return, a merger in 1946 had reorganized the studio as Universal-International. In 1949, he played the lead role in Francis, the story of a soldier befriended by a talking mule. The film was a huge success. As a consequence, his musical career was constantly interrupted by production of one Francis film per year until 1955. O'Connor later said the films "were fun to make. Actually they were quite challenging. I had to play straight in order to convince the audience that the mule could talk." In 1952 O'Connor signed a three-picture deal with Paramount. It was because of the Francis series that O'Connor missed playing Bing Crosby's partner in White Christmas. O'Connor was unavailable because he contracted an illness transmitted by the mule, and was replaced in the film by Danny Kaye. O'Connor's role as Cosmo the piano player in Singin' in the Rain earned him a Golden Globe Award for Best Performance by an Actor in a Comedy or Musical. The film featured his memorable rendition of "Make 'Em Laugh". O'Connor said he smoked 4 packs of cigarettes a day during filming. Another notable role was as Tim Donahue in the 20th Century Fox musical There's No Business Like Show Business(1954), which featured Irving Berlin's music and also starred with Marilyn Monroe, Ethel Merman, Mitzi Gaynor and Johnnie Ray. O'Connor was a regular host of NBC's Colgate Comedy Hour. He hosted a color television special on NBC in 1957, one of the earliest color programs to be preserved on a color kinescope; an excerpt of the telecast was included in NBC's 50th anniversary special in 1976. In 1954, he starred in his own television series, The Donald O'Connor Show on NBC. In 1968, O'Connor hosted a syndicated talk show also called The Donald O'Connor Show. He suffered a heart attack in 1971. O'Connor overcame alcoholism after being hospitalized for three months after collapsing in 1978. His career had a boost when he hosted the Academy Awards, which earned him two Primetime Emmy nominations. He appeared as a gaslight-era entertainer in the 1981 film Ragtime, notable for similar encore performances by James Cagney and Pat O'Brien. It was his first feature film role in 16 years. O'Connor appeared in the short-lived Bring Back Birdie on Broadway in 1981, and continued to make film and television appearances into the 1990s, including the Robin Williams film Toys as the president of a toy-making company. He had guest roles in 1996 in a pair of popular TV comedy series, The Nanny and Frasier. In 1998, he received a Golden Palm Star on the Palm Springs, California, Walk of Stars. O'Connor's last feature film was the Jack Lemmon-Walter Matthau comedy Out to Sea, in which he played a dance host on a cruise ship. O’Connor was still making public appearances well into 2003. The most distinctive characteristic of O'Connor's dancing style was its athleticism, for which he had few rivals. Yet it was his boyish charm that audiences found most engaging, and which remained an appealing aspect of his personality throughout his career. In his early Universal films, O'Connor closely mimicked the smart alec, fast talking personality of Mickey Rooney of rival MGM Studio. For Singin' in the Rain, however, MGM cultivated a much more sympathetic sidekick persona, and that remained O'Connor's signature image. O'Connor was married twice and had four children. His first marriage was in 1944 to Gwendolyn Carter, with whom he had a daughter, Donna. The couple divorced in 1954. He married for a second time, to Gloria Noble, in 1956. Together they had three children; Alicia, Donald Frederick and Kevin. O'Connor and Noble remained married until his death in 2003. O'Connor had undergone quadruple heart bypass surgery in 1990, and he nearly died from double pneumonia in January 1998. He died from complications of heart failure on September 27, 2003 at age 78 at the Motion Picture & Television Country House and Hospital, in Woodland Hills, California. His remains were cremated and buried at the Forest Lawn–Hollywood Hills Cemetery in Los Angeles. O'Connor was survived by his wife, Gloria, and four children. Gloria O'Connor died from natural causes on June 4, 2013, aged 84. Alice in Wonderland (1985 film) as The Lory Bird, 1985. Playing for keeps. Highway to Heaven 1987. ↑ "O'Connor, Donald David Dixon Ronald". Scribner Encyclopedia of American Lives. Encyclopedia.com. 2007. Retrieved 2012-08-24. ↑ Frank Cullen; Florence Hackman; Donald McNeilly (8 October 2006). Vaudeville, Old and New: An Encyclopedia of Variety Performers in America. New York: Routledge. ISBN 0-415-93853-8. ↑ Current Biography Yearbook, Vol. 16. H.W. Wilson Co. 1955. Retrieved 2012-08-24. 1 2 3 4 5 6 Richard Severo (29 September 2003). "Donald O'Connor, 78, Who Danced His Way Through Many Hollywood Musicals, Is Dead". The New York Times. NYTimes.com. Retrieved 2012-08-24. ↑ Chicago Born Donald O'Connor Is a Veteran of Stage and Films at 25 Zylstra, Freida. Chicago Daily Tribune (1923-1963) [Chicago, Ill] 27 July 1950: c1. ↑ Donald O'Connor's musical Journey keeps him on road Dale, Steve. Chicago Tribune (1963-Current file) [Chicago, Ill] 20 Dec 1985: n_a50. ↑ PARAMOUNT SIGNS DONALD O'CONNOR: Actor Will Make 3 Pictures for Studio -- Betty Hutton's Film May Be One of Them By THOMAS M. PRYORSpecial to THE NEW YORK TIMES.. New York Times (1923-Current file) [New York, N.Y] 24 Jan 1952: 23. ↑ "Palm Spring Walk of Stars". PalmSprings.com. Retrieved 2012-08-24. ↑ Welkos, Robert W. (2003-09-28). "Donald O'Connor, 78; Entertainer Immortalized by 'Singin' in the Rain'". latimes.com. Retrieved 12 November 2012. ↑ Gloria O'Connor, Widow of Actor Donald O'Connor, Dies at 84, The Hollywood Reporter, June 6, 2013. ↑ "The Littlest Hobo: The Clown". IMDb. Retrieved 2012-08-24. Wikimedia Commons has media related to Donald O'Connor. Donald O'Connor on "The Colgate Comedy Hour" (1951-54) at Classic TV Info. Donald O'Connor on "Texaco Star Theater" (1954-55) at Classic TV Info.